Mitt Romney adviser Ed Gillespie didn’t do his boss any favors today. 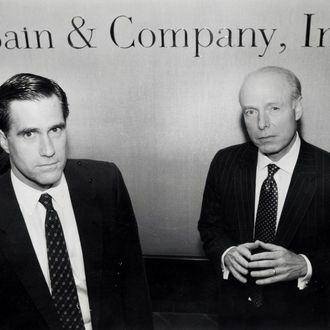 In addition to his misleading justification for the candidate’s refusal to release additional tax returns, he offered up a confusingly worded explanation for Romney’s much-discussed presence on Bain Capital’s SEC filings after February 1999, when he supposedly gave up his managing role in the company to run the 2002 Winter Olympics — a position which turned out to be a “16-hour-a day job” that left him unable to involve himself in the “day-to-day decisions” at the company. Apparently, the fact that Bain continued to call Romney its CEO and sole shareholder was just a result of the candidate’s flawed assumption that he could do it all. “He took a leave of absence and in fact, Candy, ended up not going back at all and retired retroactively to February 1999 as a result,” Gillespie said.